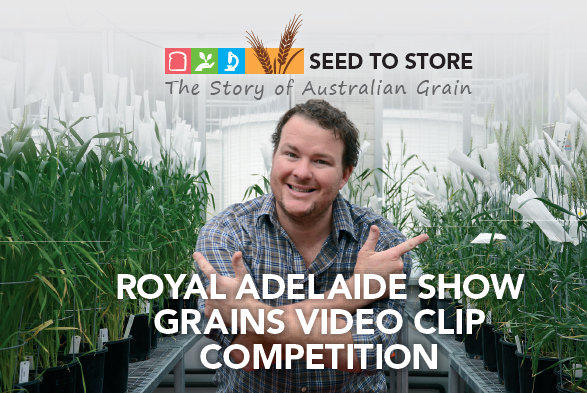 Seed to Store – The Story of Australian Grains is an exciting video clip competition which will run in conjunction with the 2016 Royal Adelaide Show. School students and community members are invited to produce a one minute video looking at the journey of grains, legumes, oilseeds and pulses from the paddock to the plate. Give the inside scoop of the grains industry! Consider including best practice science, innovation, farming, food production and the people making it happen – farmers, agronomists, research scientists, food technologists, transporters, marketers, millers, bakers, retailers! There are two categories each with $1000 to win – school students and community members. So don’t leave all the fun up to the students! Why not get involved yourself? Last year, the Waite’s own Professor Diane Mather and her laboratory team picked up third prize in the community section of the competition for their video ‘The Wheat Beat’ – you can watch their video below. Entries close 5pm Friday 12th August 2016. The top entries will be played during the Royal Adelaide Show on the Coke Stage and feature on a rolling loop in the Golden Grains Pavilion with these entrants receiving free admission to the show on Tuesday 6th September for presentations. Download the flyer to find out more information about the competition and how to enter. You can view some of the entries to the 2015 competition at YouTube.